Vacation rental house. 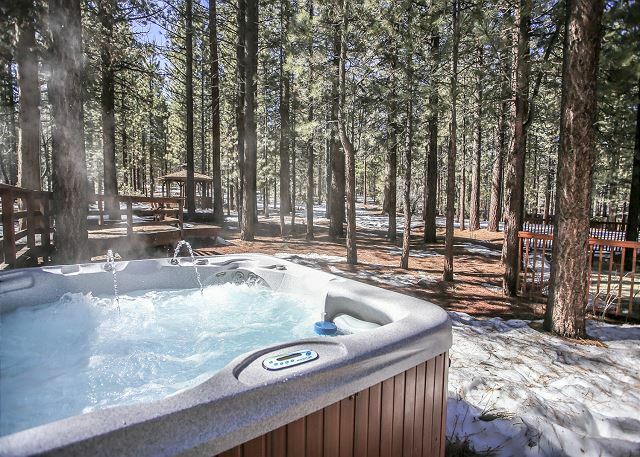 Sleeps 16, 8 bedrooms, 5 bathrooms. Cats, Dogs allowed. Centrally located this unique property has it all... Over 6000 square feet of awesome living space indoors and 4 acres outdoors! The very large kitchen has new granite counter tops and is equipped with basics plus a microwave , dishwasher and a dining room area that seats 12. 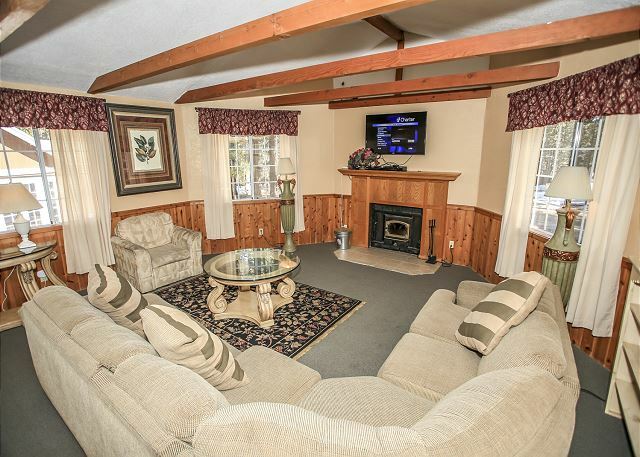 There is a lounging family room connected to the kitchen with couches, a fireplace wood stove insert and a flat screen TV/WiFi. 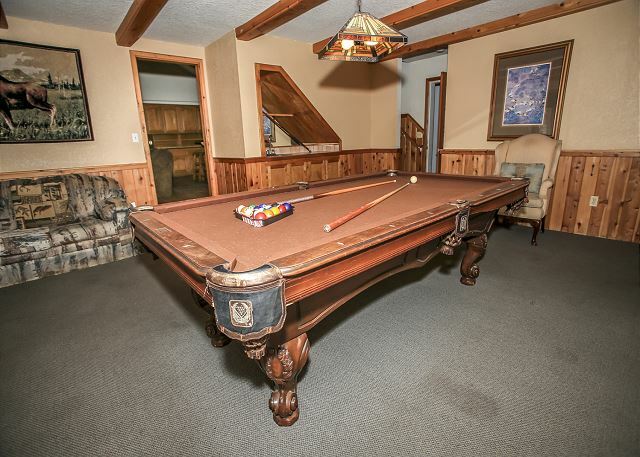 A game room with a pool table for more fun. 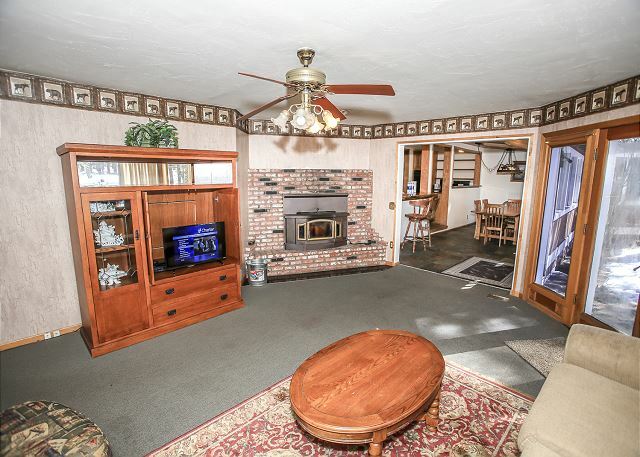 Another living room with a Franklin wood stove plus a flat screen TV/DVD provides many areas for separate areas to relax and enjoy this wonderful home. In the back yard there are wonderful decks leading to an outdoor gazebo, a beautiful pond with a water fountain and awesome outdoor spa and ample space to enjoy a great barbecue dinner for the gang. This sprawling home with amazing floor plan has spacious bedrooms and 7 TVs. "FREE WiFi"
Bedroom 1 has king size bed and cable TV. Bedroom 2 has king bed with queen sofa sleeper and cable TV. 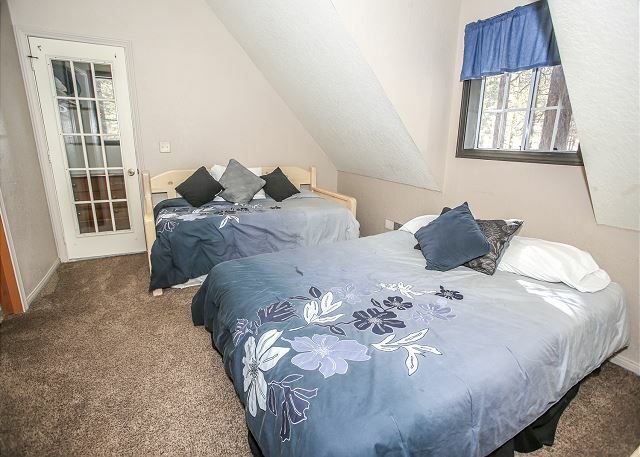 Bedroom 3 (upstairs) has a trundle bed (2 twins) and full bed. Bedroom 4 (Master) has a king size bed. The house was very accommodating for our big family. A couple issues that we had were 1. Alot of ants in the kitchen 2. Some of the couches were old and ripped. 3. No A.C as stated on the description and no screens on the windows so we couldn't open the windows, it would get very stuffy throughout the house. 4. All the TVs did not work, just the main one in the big living room but we couldn't get the DVD player to work. 5. The refrigerator & freezer did not work well. Our food was practically room temp and our icecream was pretty mushy. 6. No play room, just a pool table in one of the living rooms. The issues did not interfere with us having a great time. We made the best out of it. The best part was seating in the back deck with everyone and having bf, lunch and dinner. Our host Cody was very attentive from the moment we booked. A great place for a group to stay! The house is massive! Although a bit quirky with the way the rooms are set up and laid out, there was plenty of room for our large group. We had read the other reviews about it being cold (some rooms were cold, some were hot, hard to regulate heat in a place that big) and brought firewood and a few space heaters. That helped a lot. The property was well stocked with the basics. 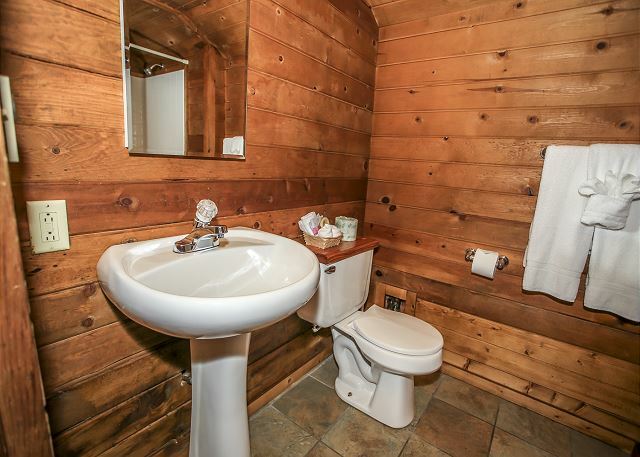 This place definitely has a "cabin" feel, not luxurious by any means, but we were completely fine with that. It had a great set up for socializing. The adults and kids all had their own areas. Kids LOVED running around outside the property. 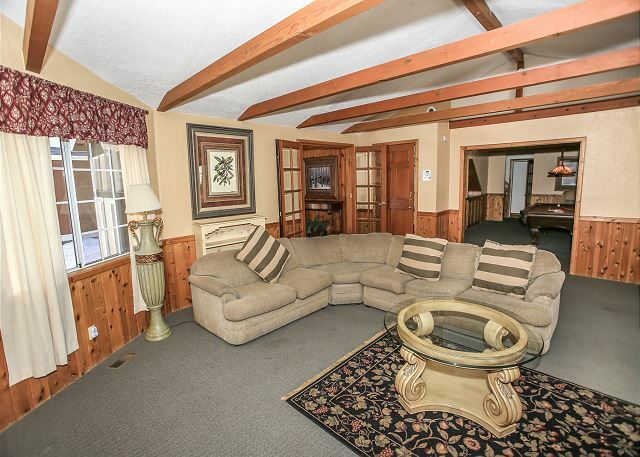 Great location, very close to town and the ski hills! We see that is for sale, but hope we will get the chance to stay here again another time. The booking experience was very good. The size of the property and the location was excellent. The place was not that clean. the fridge didn't cool our food. The heater was not sufficient. the house needs major upgrade and maintenance. coldness was coming thru the doors. Beds were not comfortable. 14 family members enjoyed our annual family reunion at this home. We had plenty of space. There were more than enough common areas for us to have our various competititive events. My only, less than positive comment is the refrigerator is a little small for such a big house. The outdoor space was beautiful too. We loved the location as the kids could go sledding without leaving the property. I accidentally left some items behind and the property manager was very nice about sending them back to me promptly. There were several living room areas which worked well for our group as we had lots of kids going to sleep early, so there was a space where we could hang out after the kids went to bed. HOUSE WAS CLEAN. 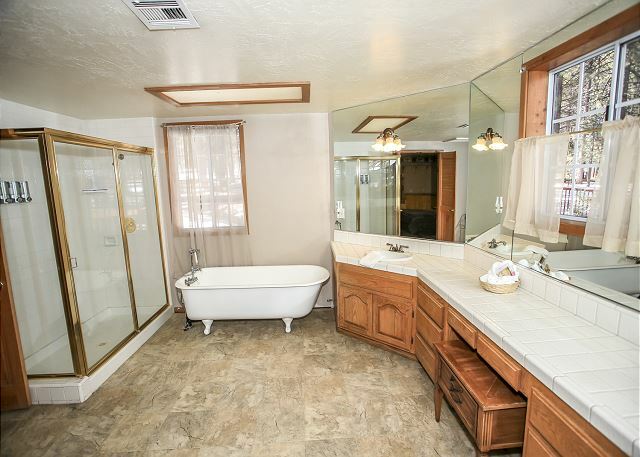 NOT AS MUCH PRIVACY FOR THE DOWNSTAIRS BEDROOM AREAS BECAUSE THERE ARE TWO BEDROOMS THAT MUST ACCESS THE REST OF THE HOUSE THROUGH THE VERY LARGE BATHROOM AND BEDROOM. KITCHEN WAS EQUIPPED SOMEWHAT... I WOULD SUGGEST BRINGING YOUR OWN POTS AND PANS. IF YOU ARE UP DURING THE WINTER WHEN IT IS VERY COLD, BRING FIREWOOD AND YOU CAN USE THE SMALL ROOM THAT GOES TO SPA AS ADDITIONAL COLD STORAGE AS THAT ROOM IS COLDER THAN THE FRIDGE!! WE LIKED THE SPACE OF THE HOUSE. THERE IS A SNOW SLIDE IN THE BACK YARD THAT THE KIDS HAD A BLAST ON. IF YOU GET SNOWED IN, PUT YOUR CHAINS ON RIGHT AWAY AND BRING ADDITIONAL SHOVELS TO DIG YOURSELF OUT. MANAGEMENT HAD THE DRIVEWAY PLOWED, UNEXPECTED SURPRISE. This property was overall, very useful. The grounds are beautiful and expansive. It's a big house so there's lots of space to spread out. We were a group of 11 and it fit us fine. 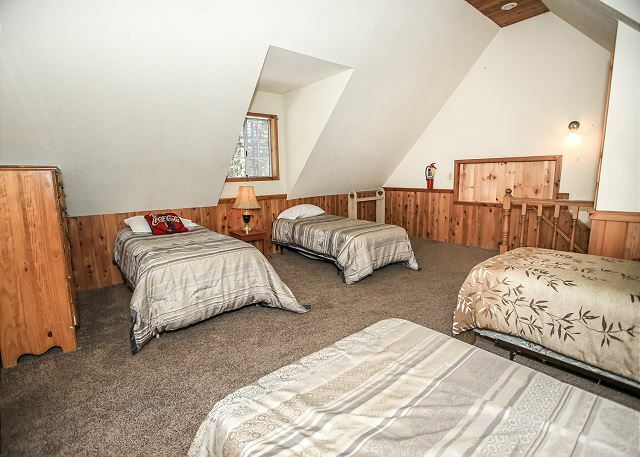 The bedrooms were as described, which is a plus. There are light fixtures that need to be repaired in a few of the bedrooms. Management was responsive to needs, especially when it came to the broken coffee maker! Being coffee drinkers, we were nervous until management showed up quickly with a new coffee maker. For a big house, there aren't enough dishes and silverware for bigger parties, so it's recommended to buy plastic / paper or bring your own. In addition, they don't supply trash bags, so bring trash bags as well (trash needs to be hauled to another location). 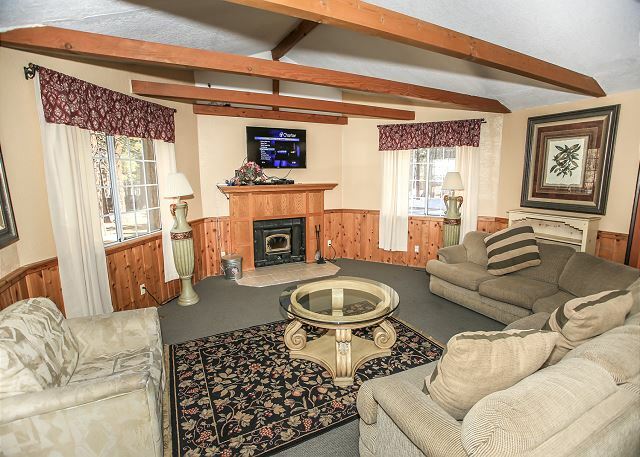 There is ample parking and the house is situated nearby to all amenities Big Bear has to offer. 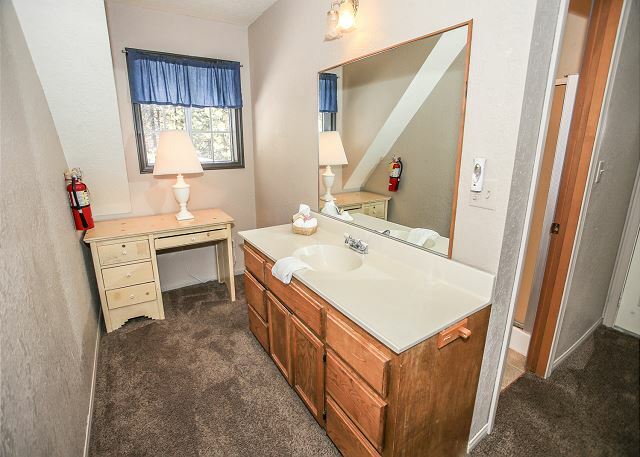 The property has a nice hot tub and even a cool water fountain in the backyard. We had a great experience at the cabin. Nice space and very private for kids to run around in the yard! Highly recommend it! Overall experience was wonderful. Family reunion would have not been the same if the house, staff were different. Great location, clean house, had everything that was necessary. Lot is HUGE!!! kids had a black just in the back yard. Thank you, thank you!.. Hope to be back soon! Amazing property that was close to town yet very secluded. We had a great time up in Big Bear at this house. Perfect for a group trip! Wonderful value for a private and spacious house. We so much enjoyed our recent stay at the Moonridge Retreat. I stayed with a group of high school students - a mock trial team and we found that the house was comfortable and large enough for 18, it could probably have held more comfortably. I was very happy with the level of privacy. 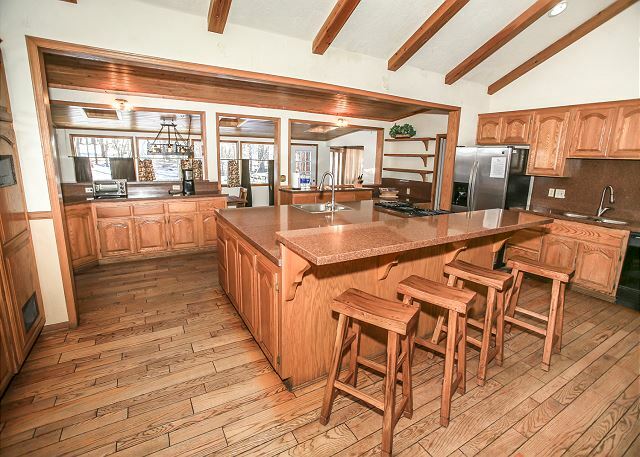 The kitchen was large and had a nice open floor plan. All the beds were comfortable and we loved the fireplaces throughout the house. One of the best aspects of the stay was the wonderful care we received from the property manager. He brought us firewood and helped us to get the fires started. All the communication and answers to our questions were prompt and helpful. Overall we had a great experience and will plan to stay again.